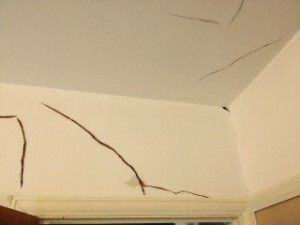 Cracks in ceilings are common in most property types. 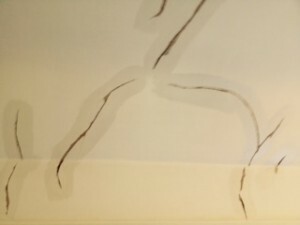 Expansion, contraction, weight of junk in the loft can all be causes of ceiling cracks. This particular ceiling was in part of a Victorian property. 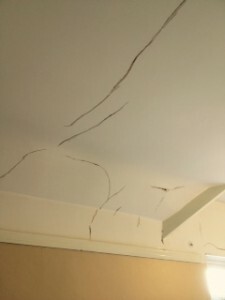 The ceiling had been neglected for many years and at first glance there appeared to be many cracks. 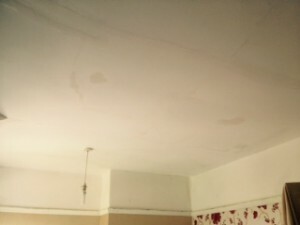 The home owner had been told that it would need to be completely removed and re-plastered. 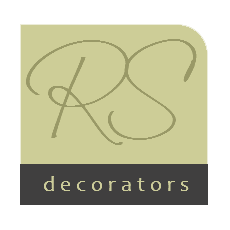 Doing so would mean a great deal of mess, dust and upheaval. In this case the cracks did not appear to be moving joints so a standard approach was used. Due to the age of the property the plaster was quite crumbly when raking out the cracks. I protected all the furniture and carpets before raking out as it can be quite messy. I also wore a good quality filtered mask to save inhaling dust from ancient plaster. To rake out the cracks I used an Olfa L5-AL blade. I also used eye protection in case of dust or a snapped blade dropped into my eyes. Once all the raking out had been completed I quickly abraded in and around the cracks with some 120 grit Abranet. This helped remove the majority of remaining loose material and removed any jagged paint edges. 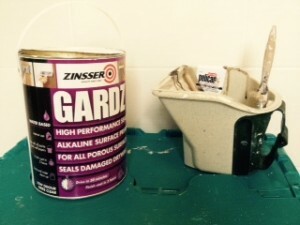 The substrate in the cracks was very porous so prior to any filling I applied a coat of Zinnser Gardz primer. This dries to a clear finish and stabilised the porosity of the area. This means less water being sucked out the filler, and, subsequently less shrinkage of the filler. The cracks were going to be filled twice with a quick sand in between. For the initial fill I used Gyproc Easifill. 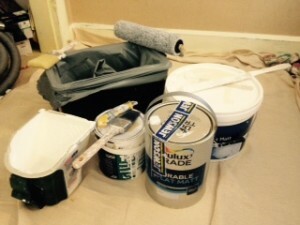 This is often used for filling plaster board joints and is inexpensive. So mixed to a fairly stiff consistency I worked the filler into the cracks, in a perpendicular fashion, finishing along the length of the crack with a flexible filling knife. The filler was left almost flush to the ceiling. 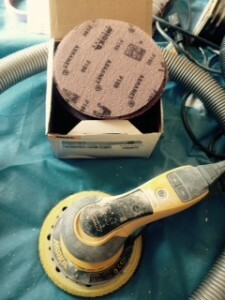 Easifill is also very easy to sand, especially with a Mirka Deros sander and dust extraction. This means there is virtually no dust. It was also quite late in the day when I applied the filler so quick drying was not an issue, and the Easifill was left overnight to dry. Once fully dry I sanded with 150 grit Abranet. There was some shrinkage as expected. For the second fill I used Toupret TX110 filler, mixed to a medium consistence. It is an easy to apply tough resin filler. I made sure to leave the filler slightly proud of the cracks so that the final sand a few hours later meant the cracks were now flush with the ceiling. Another issue with this ceiling was a hair line crack around the edge. I applied a bead of caulk and smoothed off with my finger. 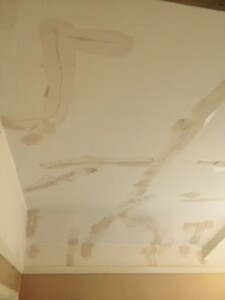 I had specified Dulux Durable Flat Matt paint for the ceiling and this is particularly bad for crazing over caulk. To prevent this from happening I applied a coat of Zinnser Coverstain. The ceiling was quite patchy in colour due to age and lots of filler so I initially applied a coat of Jewson white contract matt. This acted as a primer for the absorbent filler and also evened out the colour a little which meant less coats of the Dulux would be needed. Once the contract matt was completely dry I applied two coats of the finish paint with a 12 inch Friess roller and a 2.5 inch Corona Kingston brush.